This is probably a stupid question, but is there a way to check what your internet speed is? I know what we are supposedly paying for, but I don't think they sent us the correct modem or that we are receiving the higher speed that we are paying for - is there a way to check this? Other than asking the provider obviously? I use AroundCinci.com. Link here. I got it when I had to contact IT for my broadband one time. i personally think speedtest.net is the best. it's accurate and most ppl i know are using it. :dumb: This is probably a stupid question, but is there a way to check what your internet speed is? Edited by Budfred, 21 December 2013 - 02:26 AM. Isn't there another factor involved, i.e, the server capacity of the website that you are visiting. Am I mistaken, the 'Speed Test' sites give you a best case scenario. is that slow? what is grade C? thanks. 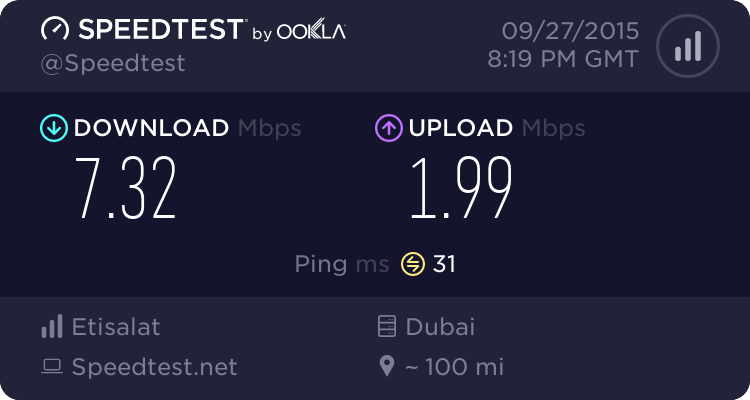 speedtest is best to check the internet speed status.